Get the book Cogan's Trade from or the film Killing Them Softly Amazon. You too can earn money from writing articles by signing up for InfoBarrel. Killing Them Softly is set in New Orleans during 2008 US presidential campaign and the credit crunch and economic crisis that were happening at the same time. During the film there are a fair number of clips from primarily television shows but some radio as well with various speeches from both then President George Bush and then Senator Barrack Obama regarding both. The film is based on the novel Cogan's Trade by George V Higgins. Mark "Markie" Trattman (Ray Liotta) runs poker games for local organised crime when his game is robbed by Frankie (Scoot McNairy) and Russell (Ben Mendelsohn), a pair of pretty much total amateurs who still manage to make of with tens of thousands of dollars. And then foolishly brag about it afterwards. 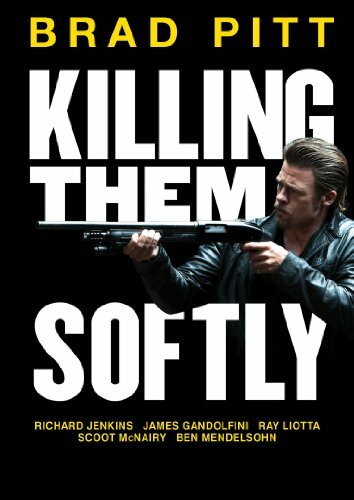 Credit: http://en.wikipedia.org/wiki/File:Killing_Them_Softly_poster.jpgJackie Cogan (Brad Pitt, Fury, The Counselor, World War Z) is a professional enforcer who is called in by the unnamed local representative played by Richard Jenkins to sort out the problem. With Markie's game being robbed, the poker games have been shut down for now; with the games being shut down, no-one is making money from them, and giving the economic climate at the time, the local mob can't really afford for the games to not be running. Cogan also calls in aging, foul mouthed, alcoholic and largely depressed hitter Mickey (James Gandolfini) from New York to help him out - ror a price of course - although that doesn't go entirely to plan. Cogan himself doesn't like killing people up close and personal - he says they cry and plead and it's an altogether unpleasant experience. Instead, he likes to "kill them softly" from a distance - although sometimes the distance is pretty short. Really, he prefers to kill without warning so the person he's going to kill doesn't have the chance to get all emotionally upset over it. The film is shot against a background still suffering from devastation after Hurricane Katrina, with many buildings abandoned and boarded up. The weather is either grey or raining, contributing to the downbeat feel of large parts of the film. The main downside of Killing Them Softly is it's trying a little too hard to be stylish. It is quite stylish anyway, but it does seem to be pressing the point a bit too much. Despite this, it's still a good film although it is also pretty violent with several brutal murders and a rather graphic assault. There aren't really any characters you can empathise with that much as these aren't really nice people, even if some of them do have certain principles they try and stick by. Cogan for one would still kill someone just to make a point. In fact, he'd rather kill them than have them beaten up, although he is willing to do both if required. It isn't a cheery film, but it isn't filmed as such. Killing Them Softly is about people going about their business; it's just that their business is violence, murder and criminal acts.